Islamic State militants say they have destroyed an ancient Mar Behnam Monastery in northern Iraq. The monastery dates back to the 4th century and reportedly has one of the most valuable Syriac libraries in existence. The images, displaying the destruction of a monastery tomb complex in Nineveh Province, were released on the internet on Thursday. It’s not yet clear when the site was destroyed. The photos also allegedly depict the bombing of a number of Shiite mosques and shrines in the district of Hamdania, northern Iraq, reports ARA News, citing local residents. The authenticity of the photos showing the monastery destruction was confirmed by Dr Nicholas al-Jeloo, an expert on Assyrian monasteries in Iraq from the University of Melbourne, to International Business Times. "IS is destroying the rich cultural fabric of the area, the multilayered, multilingual, multi-ethnic aspects of society. It's not just our heritage; it's the heritage of the world. It is part of our history, and now it's gone." Christians and the other minorities in Iraq are in great danger, believes Ignatius Joseph III Yonan, patriarch of Antioch. “We call on the world that calls itself civilized to help us stay in our land, and defend our rights as citizens,” he told the Guardian. Mar Behnam Monastery was founded in the 4th century in honor of Behnam and Sarah, children of Senchareb, an Assyrian king. They were murdered after converting to Christianity. 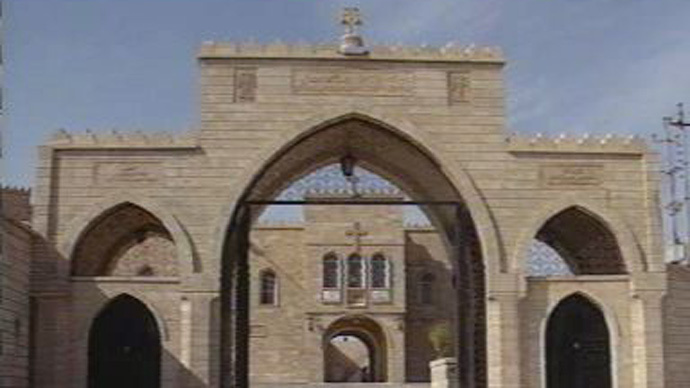 In 12th century, the Syriac Orthodox Church renovated the monastery. Syriac calligraphy presenting the genealogy of Jesus from the Gospel of Matthew, dating back to the 17th century, was also reportedly preserved in the monastery. Mar Behnam Monastery is not the first heritage site to be destroyed by Islamic State militants. Earlier in March, Iraqi authorities announced that extremists had demolished the remains of the ancient city of Hatra in the north of the country, following a “bulldozing” of the ancient Assyrian city of Nimrud, also located close to Mosul. The attack on Nimrud came a week after IS jihadists destroyed another historic site - a museum in the Iraqi city of Mosul as shown in a video posted by the extremists. However, it was later revealed that the ancient statues were in fact replicas of precious artifacts of Iraqi heritage. The real masterpieces of antiquity are said to be in Baghdad.